Cloud radars are used for remote sensing of clouds. The chosen wavelength of the emitted waves of cloud radars allows the identification of cloud droplets and ice crystals in particular. The intensity of the backscattered energy depends on the number of particles as well as on the sixth power of the particle size and the squared mass. These relationships show information reaching from size and number to fall speed of the observed cloud particles. Cloud radars are key devices of LACROS and Cloudnet to determine the structure of clouds which cannot be penetrated by lidars. 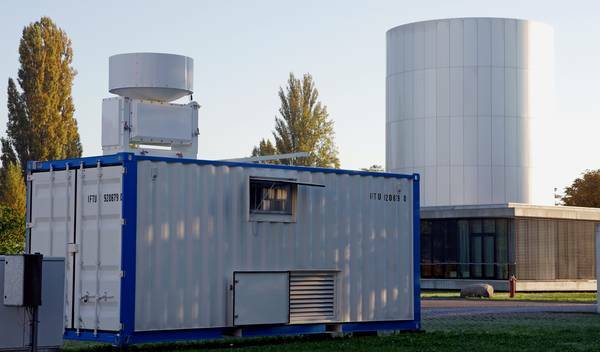 Therefore they are also central instruments for the investigation of aerosol-cloud interaction. For continuous observation of cloud properties TROPOS operates the cloud radar Mira-35 of the company Metek.